Sergio Serna is a social worker whose interests include forensic social work and public child welfare. He is committed to working with children and families engaged by the public child welfare and juvenile justice systems. He is also interested in crossover youth and minority overrepresentation in the child welfare and juvenile justice systems. 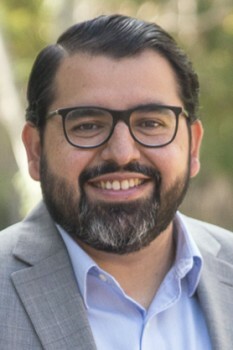 As a field consultant with the California Social Work Education Center program, a statewide program that trains social workers to become professional public child welfare workers, he works with first and second-year students placed in the Los Angeles County Department of Children and Family Services (DCFS). Prior to joining the field faculty Mr. Serna was a social worker for the Center for Juvenile Law and Policy based at Loyola Law School. Mr. Serna provided support and mitigation to youth engaged by the juvenile justice system in order to help them navigate probation, detention and reentry. As part of a holistic team in a legal setting, Mr. Serna helped to interpret the context in which legal problems develop for youth due to poverty, minority membership, educational issues, gang membership, and history of abuse. Mr. Serna was also a therapist at the Children’s Institute, Inc., working with children and families from Koreatown and surrounding areas of Los Angeles. While there, he provided individual, family and group therapy. He specialized in children and families suffering from complex trauma due to exposure to domestic violence, sexual abuse and community violence, and worked with adult domestic violence survivors in order to increase their ability to provide support and create a safe environment for their own children. He also lead a program for Youth with Sexual Behavior Problems to assist children who have engaged in sexually inappropriate behavior. The purpose of the group was to help these children develop alternative behaviors and appropriate boundaries when interacting with others. As an award recipient of Title IV-E program in California, after receiving his master’s degree he worked in the public child welfare system in both Orange and San Diego Counties to fulfill his commitment to addressing the needs of children exposed to abuse and neglect.